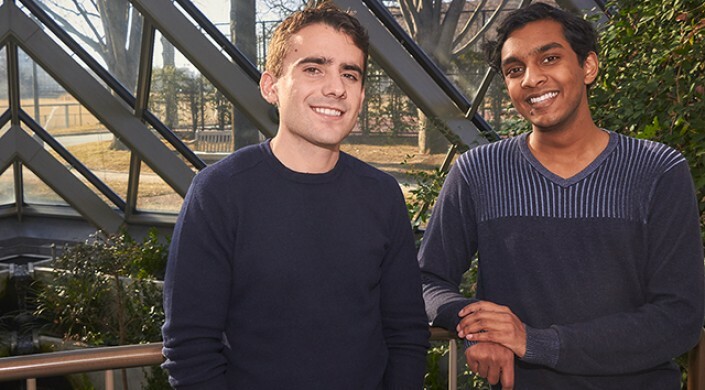 Curious about medical technology, friends and classmates Jose Amich and Raahil Sha jumped at the opportunity to sit in on a surgery at Massachusetts General Hospital during an undergraduate course. Watching the surgeon perform a minimally invasive procedure, they noticed how heavily he relied on a CT scan and MRI, which affected his speed and efficiency. They began building the back-end algorithms to power such a tool and soon, the startup Z Imaging was born. The company develops augmented reality (AR) toolkits that can be used to power applications in medicine and industry. Sha, who was then completing a senior thesis on alignment between different sets of 3D data, drew on optimization and linear algebra lessons from SEAS courses to build a software development kit from scratch. He and Amich had to balance tradeoffs between speed and accuracy while designing tools for high-stakes situations. Using computer vision and other machine learning techniques, they created software that can perform highly accurate alignment between the virtual and real worlds with only sub-millimeter errors. As they refined the software, Sha and Amich also relied on the SEAS course Startup R&D (ES 95r), taught by Paul Bottino, Executive Director of Innovation Education, for help launching a startup. They took to heart Bottino’s advice on the importance of talking to experts and potential customers. Through those business conversations, they decided to focus on health care and industry. Amich and Sha also relied on the invaluable support, mentorship, and resources they have received through MassChallenge and the Harvard Innovation Labs Venture Incubation Program. Z Imaging’s software development kit enables developers to build custom AR tools that seamlessly fuse 3D images with objects in the real world. The co-founders are also exploring the development of packaged solutions for specific industries, such as the aerospace sector. In aircraft quality control, for instance, an AR-based interface could provide a technician with process instructions and important information about different aircraft components. It could also enable a worker to overlay virtual images of undamaged parts to identify defects. “We can do some very precise localization of the different pieces with sub-millimeter precision, so we can also navigate technicians through a protocol involving assembly of very small components,” said Amich. As technology continues to evolve, Z Imaging will be able to provide even more precise solutions, Sha said. For instance, advancements in 3D camera and AR headset technology will enable even more detailed overlays. Sha and Amich are excited to propel Z Imaging into the future. The firm recently secured its first client—a company that is developing an AR-guided surgical system—and they are working with other potential customers, including a major Chinese hospital and an aircraft manufacturer. While the risks of making their college startup into a full-time job loom large for Sha and Amich, they are inspired by the opportunity to use their skills and passions to make an impact.